Glenn Gould playing any classical composer in a manner that is quite contrary is not so strange given the legendary pianist’s penchant for “disagreeing” with many a composer’s musical “directions” when it comes to a piece. However, Jim Gelcer and Paul Hoffert never “hack” it through their Beethoven. Nor, for that matter, did Mr Gould despite his bizarre and eccentric performance of the First Piano Concerto of Johannes Brahms, with The New York Philharmonic Orchestra where he and its music director, Leonard Bernstein famously publicly disagreed before the concert of April 6, 1962. In fact, if anything, Mr Gelcer and Mr Hoffert are quite reverential despite “simplifying” some of Beethoven’s iconic works giving them a swing and, therefore, broader appeal to something constituting more than a salon at which the “Ludwig” of this recording might have premiered them a couple of hundred years ago. Of course it pays to have audiences with more open ears today. It also pays to have someone like flutist Bill McBirnie join you on the “Moonlight Sonata” a.k.a. (here) “Moon Light” and then again on the adagio of “The Emperor Concerto” a.k.a. (here, again) “The Other Fifth”. It also pays to have George Koller, whose prodigious musicianship as a contrabassist lifts every work on this disc whether in pizzicato harmonics or con arco, or simply in the manner in which he brings his virtuoso playing to ensemble playing with this trio. Ifield Joseph’s guitar also sparkles and fizzes on “VitaminB51”. And if at first the word “vitamins” might seem at odds with Beethoven’s music, the swing of delight with which all of this music is played more than smooths over the furrowed brow. Moreover, everything rights itself in the end with a sparkling version of “The Moonlight Sonata” because Mr Hoffert, Mr Koller and of course Mr Gelcer swing their way through the work with an elegance that reverberates through Mr Hoffert’s use of pedal and Mt Koller’s sinuous plucking and Mr McBirnie’s gloriously brooding flute. At the end of it all one is left with a recording that brings Beethoven out of the lofty portals of his era and into a club where it becomes a singular delight to experience his music, which is what it’s all about no matter which way you look at it; as long as it’s not music by cookie-cutter, which so much music is nowadays. 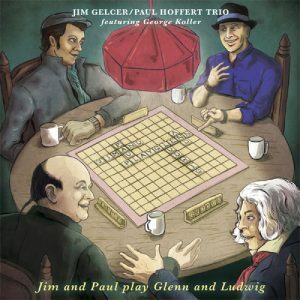 At least Jim Gelcer and Paul Hoffert play music in praise of two famous ghosts without turning it into an unlistenable hodgepodge thanks to some quite inspired arrangements and brilliant performances all round.